Bradley replacement promises to take a technological leap into the future fight. The Bradley Fighting Vehicle of the past nearly 40 years, which, with the M1 Abrams tank, spearheaded the coalition victory over Iraq in Operation Desert Storm, is destined to be a part of history before long. In its place will be a member of the Next Generation Combat Vehicle (NGCV) family, a work in progress at the top of the list for the Army’s high-priority, multipart combat vehicle modernization initiative. The armored personnel carrier of the future, officially being developed as the Optionally Manned Fighting Vehicle, will be stealthy, adaptable and able to defeat enemy fire, as Coffman described it. Perhaps most important, it will be easy to upgrade. “ ‘Upgradability’ is king,” he said. Upgradability will be important for the other four elements of the new ground combat vehicle, as well: the Armored Multipurpose Vehicle, replacing the M113 Armored Personnel Carrier, which also cannot accommodate any more upgrades; the Mobile Protected Firepower light tank; the Robotic Combat Vehicle; and the Optionally Manned Tank. The Bradley M2 and M3 Infantry and Cavalry Fighting Vehicles, respectively, were not quite in production when the Army began laying the groundwork for the generation to follow. An article in the May-June 1981 edition of Army RD&A, the predecessor to Army AL&T, described efforts by the U.S. Army Tank-Automotive Command (TACOM) to explore with Soldiers and industry the technological capabilities that Army combat vehicles would need on the future battlefield … of the mid-1990s. In “Fighting Vehicles: The Next Generation,” Clifford D. Bradley, then-chief of the Exploratory Development Division of TACOM’s Tank-Automotive Concepts Laboratory, described a May 21, 1980, all-day presolicitation conference that his laboratory hosted to discuss future close-combat vehicles with some 220 representatives from industry and government. 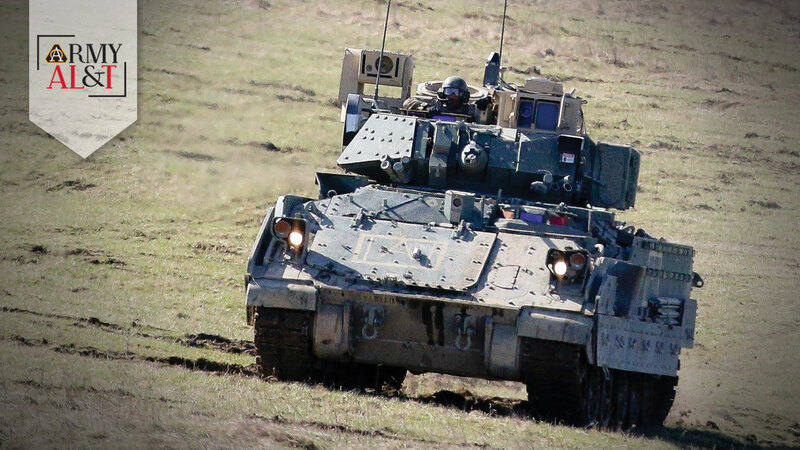 “The objective of the conference was to bring the best ‘brains’ of industry together for the specific purpose of inviting them to look at the challenge of the follow-on vehicles,” the aptly named Bradley wrote. The conference kicked off a competition to identify and develop “the best concept or concepts to fill the future role of the follow-on Ml, M2 and M3.” The Army chose four industry teams to evaluate technologies and trade-offs and produce detailed designs of the selected concepts. Also taking on the challenge was an in-house team. A year later and after several in-progress reviews, the industry and in-house teams would present their final concepts of next-generation combat vehicles to TACOM for review. A team of experts from the U.S. Army Training and Doctrine Command and the Army Materiel Development and Readiness Command, the predecessor to U.S. Army Materiel Command, would then evaluate and rate the concepts. If the process has a familiar ring to it, there’s a reason. Nearly 40 years later, the Army is emphasizing collaboration with industry and across the doctrinal, combat development, test and evaluation and Soldier-user communities as it modernizes at unprecedented speed. Back to the present: The Bradley’s 2026 replacement will not only have to dominate against enemy anti-access and area denial strategies, likely in an urban setting, but also defend itself against enemy attack. 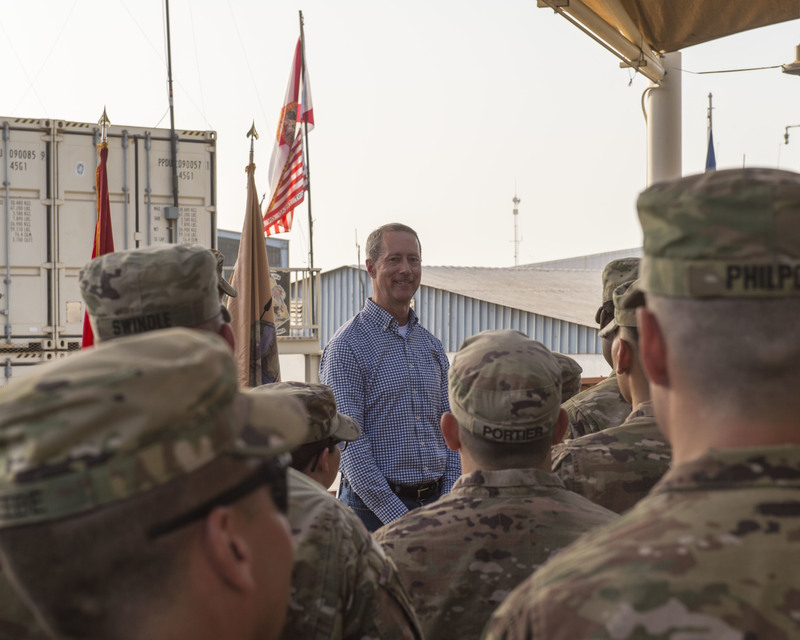 Gone are the days when the United States could count on neutralizing enemy forces with airstrikes to clear the way for ground troops to enter a relatively uncontested battlespace on open ground. Weapon systems on the next generation of combat vehicles will have to aim higher and lower than present combat vehicle-mounted guns—a characteristic known as elevate and depress—“so that you can fight the enemy in tall buildings or in basements,” said Coffman, whose first operational assignment was as an armored cavalry platoon leader in Operations Desert Shield and Desert Storm; one of his most recent was as a heavy infantry battalion commander in Operation Iraqi Freedom. “Our legacy fleet was designed to fight in Eastern Europe against a known enemy in known terrain. The elevation and depression was not as important,” he said. Combat vehicles also must protect the Soldiers riding in them, as the U.S. military’s experiences in Iraq and Afghanistan have shown. The rampant threat of improvised explosive devices and mines, for example, drove key innovations, including the double-V hull introduced in 2011 for the Stryker fleet. The double-V hull deflects blasts away from the vehicle and the Soldiers inside. Rocket-propelled grenades and Russian RKG3 parachute-equipped hand grenades are just a couple of the enemy weapons that the Army’s future combat vehicles will need to defend Soldiers against. The Army is not starting from scratch in developing the Next Generation Combat Vehicle family. It will feature a number of combat-tested capabilities introduced to the current fleet through incremental upgrades, including the double-V hull, Coffman said. Another technology that holds promise for future combat vehicles is the Stryker urban kit, basically a large cage on the vehicle designed to keep rocket-propelled grenades and thrown explosive devices from hitting the vehicle itself. Additional battle-tested technologies include see-through armor; jamming technologies to defeat enemy radio capabilities used to detonate bombs; and bomb-removal systems. The engine must not only generate enough power for what the first model will do, but have sufficient excess capacity to allow the Army to add requirements as technology advances. Ditto for space in the vehicle. The reason the present-day Bradley cannot accommodate any more upgrades is that there is no reserve space, weight and power capacity left. The vehicles cannot run continuously on the battlefield, for reasons of stealth and fuel efficiency. The Bradley replacement, as well as other combat vehicles, will need to have a silent capability in its power source, a battery backup allowing the crew to operate without running the engine. 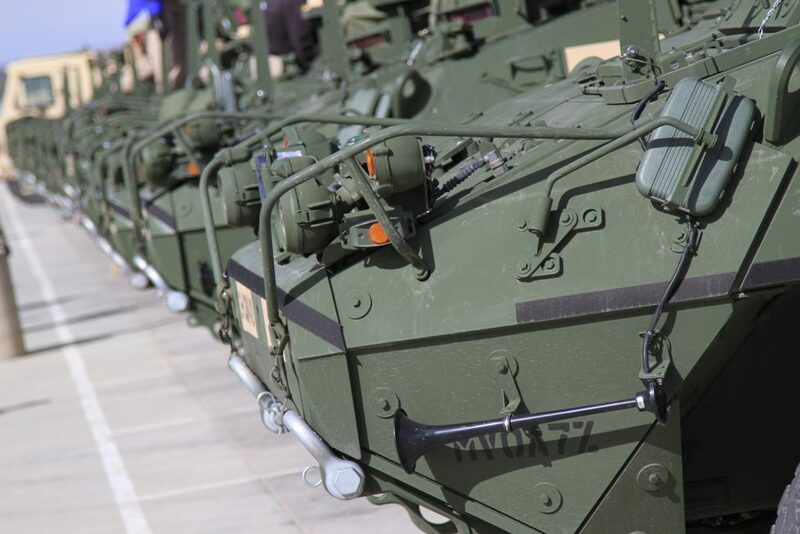 Brand new double-V hull Strykers are neatly arranged in the 2nd Squadron, 1st Cavalry Regiment, 1st Stryker Brigade Combat Team, 4th Infantry Division, motorpool, April 29, 2014. First SBCT is the first brigade to field the double-V hull Stryker and will be equipped with a total of 336 Strykers in seven different variations once the conversion is complete. Incremental upgrades are an established concept in combat vehicle development. The Next Generation Combat Vehicle initiative is just taking it to a new level of planning. The five vehicles in the Next Generation Combat Vehicle initiative are moving forward at varying paces. The Optionally Manned Fighting Vehicle initiative to replace the Bradley began about a year ago, with 2026 the anticipated date for the first unit to be equipped. Army Futures Command published the draft request for proposal in January to get industry feedback, followed by the final request for proposal in March. Next March, the command expects to award contracts to two vendors for the engineering and manufacturing development phase. FY23 is the target for a milestone C decision. This article is published in the April-June 2019 issue of Army AL&T magazine.